In a 180-degree change from previous decades, during which public space was thought of mainly in terms of facilitating automobile circulation, the City of Paris has been implementing an ambitious strategy to rethink the role of the car in the city. The new approach, which puts the quality of the urban experience at the heart of urban policy, has led to a complete redefinition of Paris’s urban spaces. The story began in 2001, when the Conservatives, who had dominated Paris politically for more than a century, lost Paris City Hall to a Left-Green coalition led by Bertrand Delanoë. Delanoë, who has been Mayor since that time and will step down next March, has led an agenda focused on concrete, everyday issues aimed at making a difference in the quality of life of Parisians. Public space and mobility have featured prominently in the new political program. 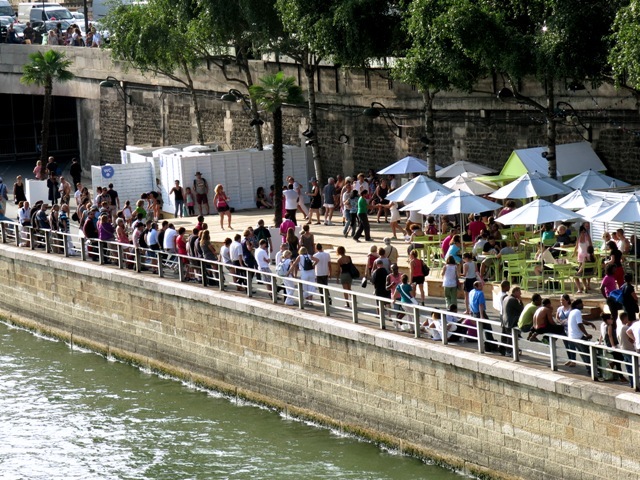 The Delanoë city administration has opened bicycle lanes, launched a bicycle sharing scheme, built a major new tramway line, changed parking policy to encourage people to leave their cars in their home neighborhoods, opened several new parks, and even re-purposed a former highway as a public promenade along the Seine. The Department of Roads and Mobility (Direction de la Voirie et des Déplacements) has driven much of the change in Paris’s public spaces. 185 acres of Paris’s streets have been given over to cyclists, sidewalks have been widened, parking has been restricted, and many public spaces have been redesigned according to the new philosophy. The first results of this orientation are now coming to fruition, and have fundamentally changed Parisians’ experience of their city. Automobile traffic has dropped 25% since 2002 and the level of car ownership among Parisian households has decreased to only 37%. With a conscious, large-scale shift underway in how public space is shared between cars, bicycles and pedestrians, Paris is emerging as a leader among forward-thinking cities. Despite the tremendous changes, the City does not at all consider the program complete. 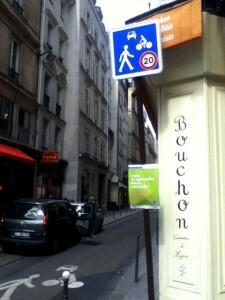 It is now working on a new set of initiatives to make Paris still more friendly as a city for people. 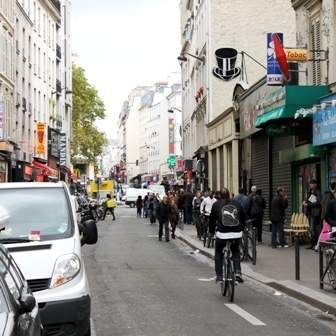 The City administration feels that Paris’s current default speed limit of 50 kilometers per hour (31 mph) is simply not compatible with shared use of public spaces. So it has set its sights on a major milestone: the implementation of a 20 kilometer per hour (12 mph) speed limit within the entire city limits, except for a small number of designated major arteries. Already it has started an aggressive expansion of the existing 20 kilometer per hour zones. The City has started implementing a new “shared space” concept. Several streets have been given this new status, in which vehicle traffic does not have the right of way and all users are expected to share the space equally. There has been no major rebuilding on the “shared space” streets, so there continue to be sidewalks and a traditional street lay-out. But new signs and floor markings indicate that the space is to be shared by all, and speed is limited to 20 kilometers per hour. These spaces have a distinct feel, very different to both ordinary streets and to pedestrianized areas, and seem to be working well. 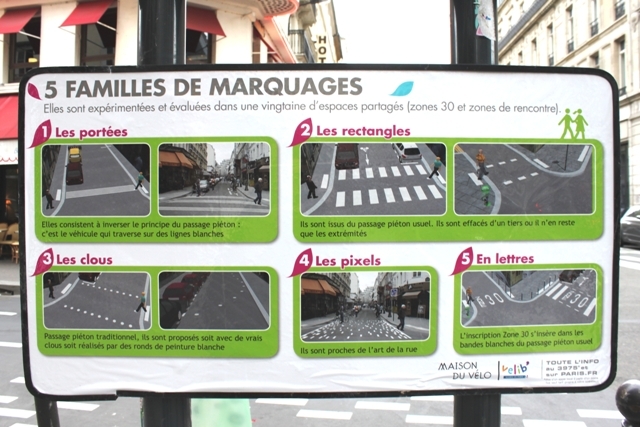 In 2012, the Department of Roads and Mobility began implementing an initiative named ‘Paris Piéton’ — i.e., ‘Pedestrian Paris’. The aim of the program is to consider the pedestrian not just as someone who is moving from one point to another, but as a person who is experiencing the city. These findings have been used to guide new initiatives for public spaces across the city, based on the general idea of fully taking into account the experiential needs of people walking in the city. This, needless to say, is diametrically opposite to the to past Paris city administrations (and to current administrations in many other cities around the world) who view such problems exclusively through the lens of traffic engineering. The hope of those responsible for the implementation of Paris Piéton is that people will begin to appreciate the many alternative uses that can be found for the public spaces that are currently given over solely to vehicle transportation. The City wants to encourage café terraces on former parking spaces, mini-gardens in urban nooks, and all sorts of other creative ideas. Over time, it is hoped that the level of reliance on the automobile will continue to decrease and that demand for more of these new kind of public spaces will strengthen. As new types of public urban spaces emerge, the City of Paris would like to see the relationship of Parisians with their urban space change as well. France has relatively little experience with privately-owned and especially privately-maintained public spaces. Strict rules on the private use of public space and a tendency to rely on the government have had the effect of stifling individual initiative. The City of Paris would like to see that change and is seeking to encourage American-style community projects. A number of pilot projects are underway to encourage private appropriation and maintenance of public space. By this, the City hopes to reduce the cost of maintenance, but especially to increase the community spirit in Paris’s neighborhoods. How this policy will play out, especially in some of the more difficult neighborhoods, has yet to be seen. All this activity is unarguably having the effect of changing what kind of a place Paris is to live in. With its creative and activist approach, the City of Paris is at the forefront of cities that are placing livability at the top of the agenda. Its willingness to experiment and innovate makes Paris a key city to watch in this area.